A FREE self-paced guide to creating animated GIFs that explain your ideas quickly. Using common tools like PowerPoint and Screencasting, we'll show you exactly how to create and share useful animated GIFs. This guide is a sample of our online courses at the Explainer Academy. Wait, what is this, again? The purpose of this guide is to show you how to design and create an animated GIF that explains an idea. It will teach you about the strengths and weaknesses of the GIF format and how to maximize it for your goals. The guide is designed for communicators and educators who need better ways to get their message to their audience. This guide is not focused on designers and does not rely on expensive tools like Photoshop (you can learn that process here or here). 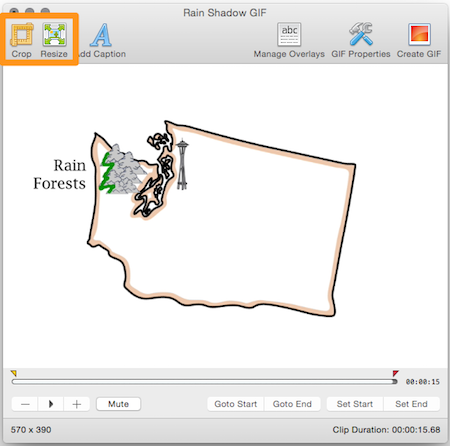 The goal of this guide is creating useful, educational animated GIFs using common tools. I'm ready to get started creating GIFs. Can I skip to that section? Of course. The sections labeled "Skill:" contain the specific tools and processes. The first skill focuses on finding or creating visuals. Go there now. The "Background" sections are designed to help you understand the GIF format, its strengths and weaknesses and how GIFs have evolved. What tools do I need to create an ExplainerGIF? Presentation Software (PowerPoint, Keynote) - For designing and creating animations. Please note that the guide provides links and descriptions to a wide variety of free and paid tools that could work for you. Why would I want to create an ExplainerGIF? Increased Shareability - Unlike online video, GIF animations play everywhere, including email. No plug-ins or embed codes are required. They just work. New DIY Production Tools - We now have easy access to tools for creating our own GIFs. Are you selling something? Is this an ad? This guide is a free service of Common Craft and contains information about our Cut-outs, which are useful in creating ExplainerGIFs. The guide also serves as a preview for our Explainer Academy, which is currently in development. We are not affiliates for any of the products we recommend in the guide and no company has influenced our recommendations. There is no paid third-party advertising. You can consume the content in the guide in less than 30 minutes. Once you've learned the basics, you should be able to create an original ExplainerGIF in 15 minutes, depending on your design. How do you pronounce "GIF"
This is a touchy subject. We say GIF like "Gift". Other's say GIF like "jif" the peanut butter. Please don't judge us. This guide includes a number of animated GIFs and you'll see them take two forms. 2. GIF Player - Instead of the constant looping, we've added a blue play button that gives you control of when the GIF starts. One click starts the animation, a second click stops it. Try it! Please note that the guide does not cover how to publish animated GIFs with a play button. That requires technical know-how that is unique to your usage and beyond the scope of the guide. Let's Get Started! Our first step is learning more about animated GIFs. Background: What is an Animated GIF? The animated GIF is a strange animal. At heart, an animated GIF is a digital image just like any other image you see online. But it's also a lot like a video, with movement and flow. Animated GIFs look like videos, but behave like images. Perhaps they are the platypuses of the digital world (but prettier). By unpacking how they actually work, you'll see that their power is easy to understand. G.I.F. stands for Graphic Interchange Format and was invented by the Compuserve Corporation in 1987. A team at Compuserve tweaked the format to allow for individual GIF images to be combined into an animation - an animated GIF. Then, in the 1990's Netscape created a way for animated GIFs to play in a loop on web pages. These early web pages, runnning on slow connections, could display something with movement and interest. That was the beginning of the first golden age of animated GIFs. Develop powerful explanation skills and learn to create Common Craft Style videos via online courses. Learn more. It's easy to take digital photos for granted. They're easy to take and easy to share. All it takes is the click of an "upload" button and your image can appear on websites, social networks, in email newsletters, on mobile phone, etc. Digital images just work. An Animated GIF is a Digital Image, Too. An animated GIF is like a video that works everywhere. But you don't have to worry about players or plug-ins or device compatability. It's simple. An animated GIF works almost anywhere an image can be shared online - and that's truly powerful. Animated GIFs have limits. Because most GIFs are shared online, it's important that they play nicely with web pages and email newsletters. Like a photo or video, animated GIFs work best when they have a small file size. If the file size is too big, the page won't load quickly. The file size constraint is perhaps the most important technical consideration regarding animated GIFs. Color - A few, simple, flat colors are best. These constraints may seem, well, constraining. But really, they give the format a shape, a starting point. When you set out to make an ExplainerGIF, some decisions are already made for you. This allows you to focus on content. The latter part of this guide will cover multiple ways to reduce file size in the production process. Most animated GIFs we see today are created from existing videos. People find a clip they like and convert it to an animated GIF. For example, services like GIFSoup and GIFYouTube automatically turn YouTube videos into animated GIFs. This has created an explosion in GIFs. Sites like Giphy are becoming the YouTube of animated GIFs. This explosion happened because new tools made it easy to turn almost any online video clip into a GIFs. I call this the second golden age of animated GIFs. Converting an existing video to an animated GIF is the easy part. It's producing the source material that is the real challenge (and opportunity). Up to now, few people have had the know-how and tools to create compelling animations for animated GIFs. With this guide, we aim to change that. We will show you easy ways to create and capture animations. As noted previously, animated GIFs can be created from a huge variety of source material. Let's take a quick tour. These are classics. Notice how they work within the constraints we discussed. They are very short animations. The MC Hammer example is 139kbs. The email me example is 4kb. That's tiny! It's probably no surprise that the GIF format has been used to create art. Because GIFs loop silently, they provide a medium for creating unique, um, experiences. These are great examples of how sophisticated tools and know-how can be used to create remarkable animated GIFs. NOTE: I've included information on file size so can get a feel for how big these very short files can get. Today, animated GIFs are known for entertainment. Whether they are beautiful animations or cat video clips, the GIF format offers a way to create and share video-like animations. Unfortunately, animated GIFs made from video clips are difficult to manage. They must be very short and low resolution to remain small enough to share on the web. Animated GIF art can be difficult to create without the proper tools and know-how. Thankfully, animated GIFs can be so much more. Next: Let's consider the useful side of animated GIFs. Hilarious video clips are great, but I think we can do better. Animated GIFs can also solve problems and educate. Below are a number of animated GIFs that are designed to educate or instruct. Please note the file sizes on these examples. This animated GIF is by Digital Music News and captures 30 pie graphs, all animated to show how spending has changed over 30 years. This GIF by Intel IQ is a good example of an instructional GIF that walks the viewer through an idea via a tight combination or text and visual. This GIF by NickolayS uses looping to show the mechanics of a sewing machine in a way that feel realistic. This GIF by John Reid and and Arpad Horvath provides a visual explanation for how pi is calculated. The problem: These animated GIFs are sophisticated animations. They are difficult to conceive and produce. But don't despair. Useful animated GIFs can be EASY to create - and that's what the rest of this guide is all about. That's beautiful. Why? Because it means there is a way to create useful animated GIFs that can be long enough to explain a LOT of ideas. This example is a little bigger than my previous recommendations, but it still works great. By animating simple images on a white background in PowerPoint, we can create useful, shareable GIFs that explain ideas. These are ExplainerGIFs. The chances are, you have feelings about PowerPoint. You've probably seen it abused with boring presentations that have 15 bullet points per slide, tiny font and no visuals. PowerPoint has become a widely used and often-loathed tool for presentations. Today, I will ask you to put your feelings aside. PowerPoint (or Keynote) is simply a platform and as we'll see, it can be used for a lot more than quarterly budget reviews. 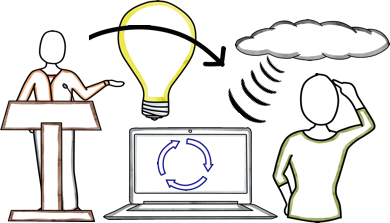 Our focus here is animation and PowerPoint has everything we need for turning your idea into an ExplainerGIF. Landing Page Promo - Imagine using an animation to show product features, use cases, value propositions. 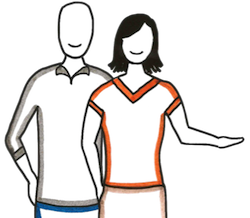 With a little practice, you'll be able to create similar animations with PowerPoint. I also use Common Craft Cut-outs for visuals. To get you started, I'll focus on a very simple animation: the Venn Diagram. This simple version will allow us to focus on the skills and mechanics of creating animations rather than picking colors and words. Wait. Are these really better than static images? It's a good question. A well-designed chart or graph can relate a lot of information without being animated. And in a lot of cases, a static image may be the best option. However, I think animated GIFs have inherent strengths that make them useful in a lot of cases. Movement attracts attention. A looping animated GIF attract the viewer's attention in a way that a static image cannot. When an animation loops, it can provide the viewer a way to digest the information more fully. Animations have the ability to pack a lot of visual information into a short, digestible package. When do animations work best? When data change over time. Consider a GIF of deforestation of a rainforest. When simple becomes more complex. Imagine a GIF that shows individual molecules combining to create an element. When multiple steps are required in a process. Examples here include tying a bowtie, or completing an equation. Viewing multiple sides of a three-dimensional object. What does it look like from the back? Or the side? By simply animating a simple graph or chart, you may be able to make it remarkable. But the real goal is to play on the strengths of animation. Often, this means showing transitions and change. At heart, an animated GIF is a visual experience. Where will you find visuals? Sure, you could create an ExplainerGIF with nothing but text and may it be awesome. But probably not. To make GIFs interesting and compelling, you'll need visuals. 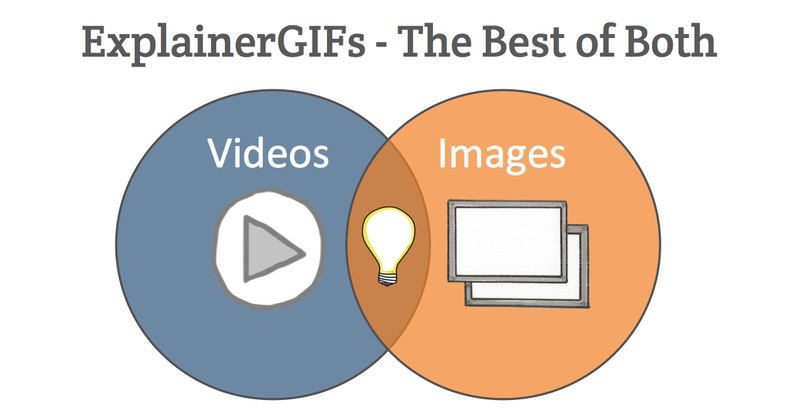 Thankfully, there are a number of options for finding drawing or adding visuals to your GIFs. Common Craft offers an online library of over 2000 high resolution visuals in "Common Craft Style" just like the ones you see in this guide. We call them Cut-outs and they are PNG files with transparent backgrounds. Common Craft Membership is the best way to access 1000s of Cut-outs. It's annual and starts at $49 a year. That's about $4 a month. FOUR DOLLARS. Check out the Noun Project. They have an impressive library of icons that form a kind of visual language. You can find huge selections of images on stock photo websites like iStockPhoto and Shutterstock and Getty Images. If you're not able to purchase the images you want, we recommend using images that are in the public domain, or are licensed for sharing. I think people would be surprised at how often I use PowerPoint to create new drawings for our videos. Once you get a few skills down, you can draw a huge number of things with your mouse. PowerPoint and Keynote have flexible tools for animating shapes and images. 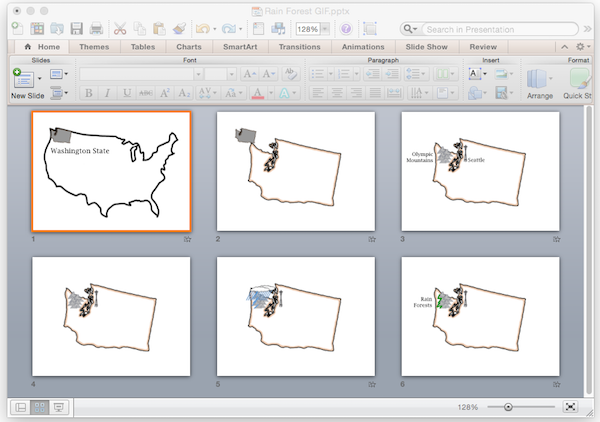 As you saw in the previous section, PowerPoint can serve as a great animating tool. Once you get the controls down, the options are endless. For our first example, we'll start very simply and animate a Venn Diagram. By using on a very short and sweet example, we can focus on the skills and mechanics of animation rather than colors and words. The skills portion of this guide will rely heavily on video screencasts. The videos are a rich source of information and I encourage you to watch them. The version of PowerPoint that appears below is PowerPoint 2011 for Mac. It should match the most modern versions of PowerPoint for PC. While your animation features may differ across software and versions, including Keynote, the ideas remain very similar. As you can see from the example above, animations can be easy to produce in PowerPoint. With some experience, you'll see that images can appear, disappear and move in almost any way you can imagine. Open a blank slide in PowerPoint with a white background. Draw a few shapes on the slide. Any shapes will do for now - this is just practice. Have the shape "fly in"
Note that you can control the speed, direction and order of the animations by using the "Animation Options". Click the "Reorder" button to see a list of every animation on the slide. Have the shape move from one spot to another in straight line, using the motion "path" options. Have the shape move on a curve. Have a shape appear, move across the slide, then disappear. Have a shape move to multiple points on the slide. Custom Animations: Use the "Custom Animations" tool to experiment with the speed and order. Select a shape and use the "with previous" and "after previous" options to control when each animation starts. Select a shape and set it to "fly in" at different speeds and from different directions. When the animation plays, we'll record what is on the computer screen using screencasting tools. While PowerPoint can technically create a video from a presentation (File --> Save As Movie) I don't recommend it. The quality is poor and in my experience, it doesn't work well with animations. Keynote creates videos with ease and good quality. However, there is limited control. Use (File --> Export to --> Quicktime) to create the video. If this is your best option, create a video and go to the next section to convert your video to an animated GIF. Screencasting is a fundamental part of creating ExplainerGIFs. If you are new to screencasting, the short Common Craft video below will give you important context on what screencasting is and how it is used. You can see why this is kind of tool is so central to creating Explainer GIFs: screencasting allows us to quickly make a video from anything that happens on our screen. LICEcap is a free screencasting tool that deserves a bit of special attention. Unlike the tools listed above, LICEcap doesn't record video. Instead, it creates an animated GIF from what it records via the transparent window that appears on your screen. This can make the ExplainerGIF process very quick. The problem is lack of control. It makes an animated GIF from everything it records and doesn't provide a way to edit the clip after it is captured. You may end up with a GIF that includes unwanted content. Timeline editing. Trim, copy-and-paste, replace clips. Speed up or slow down clips. Add highlights and annotations after recording is finished. Export video files in a variety of format and sizes. The products listed above offer a free trial and I encourage you to experiment. I've used Camtasia and Screenflow and consider them almost interchangeable. I will be using Camtasia for Mac to record my screen in rest of this guide. Bottom Line: To make ExplainerGIFs, you need some way to capture an animation on your screen and potentially edit the footage to make it look great. This process is easy to follow in the video below. The tools I use in this video are PowerPoint for Mac 2011 and Camtasia for screencasting. But these specific tools aren't required. Any tools that can play an animation on your screen and capture it as a video may work. So that's the big idea. Here, we used a very simple example of a Venn Diagram, but the process is the same for any kind of animation. We've now created a video file of an animation. You could upload it to YouTube or Facebook or save it to your phone or tablet. The problem is, videos are not universal. They need special players and settings to work correctly. Further, a simple Venn Diagram doesn't require a whole video. That's why animated GIFs are powerful. They are universal. They play everywhere. They are perfect for short, visual ideas, like diagrams and processes. Open your screencasting tool and click "record"
With the screencasting tool recording, play your animations in PowerPoint. When the animations finish, tell the screencasting tool to stop recording. If you are using a fully-featured tool, this will bring up the editing tool. If it doesn't appear automatically, drag the video file to the timeline where you can watch and edit the footage. Watch the video and consider what parts you'd like to keep. Use the editing tools to remove the sections you don't want. If possible, speed up a clip to animate faster. If possible, show down a clip. If possible, use the tool to add text to the video. When you're finished, save the file. This is saving the edits. To create a video file, Export the video and save the exported video to your computer. You have now recorded, edited and created a new video! Yay! Next, we'll look at converting that video into an animated GIF that will play anywhere. We are getting very close. You've created an animated video clip - now we just need to convert it to an animated GIF. Previously we compared animated GIFs to flipbooks, where each image only shows for a fraction of a second. By starting with a video clip, we're essentially working backwards. We're cutting up film into individual flipbook images. A few seconds of video footage can quickly become dozens of individual images that can increase file size quickly. If you don't manage them, your animated GIF will be too large to use online because it will take too long to load. 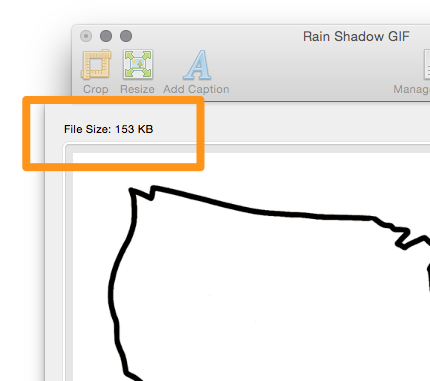 For animated GIFs to work on a web page or email newsletter, they need have a small file size, hopefully under 250kbs. Thankfully, there are multiple ways to manage the file size of your animated GIF and understanding those options will help you find the right size for your clip. Image Dimensions - This issue is the same as a single digital photograph. The bigger the image in terms of dimensions, the bigger the file size. This is often measured in pixels. A photo that 1200 X 800 has a much larger file size than a photo that is 600 X 400 because it has a lot more pixels. The same is true with animated GIFs. You can decrease the file size by resizing the images in the GIF to be smaller. Duration - It's simple. The longer your animated GIF is, the more images it will require. For this reason, most animated GIFs are under 30 seconds in duration. Color - In a digital image, color increases file size. Animated GIFs can use up to 256 colors. The more colors that are included, the bigger the file size. To reduce file size, reduce the number of colors in the images. You can also consider using black-and-white or grayscale color schemes. This can have a significant impact on file size. Video Source - When exporting a video clip as we did in the last section, you'll see options for the quality of the exported video file. These options can be used to reduce file size. For example, you can export the video at a lower quality setting, which reduces file size. You may also be able to reduce the dimensions of the video to be smaller. Frame Rate - Again, think about the flipbook analogy. With an actual flipbook, it may be possible to count how many images flip-by in one second. Maybe 5? 10? This is the frame rate - how many images display in a second. As you can imagine, the higher the frame rate, the bigger the file size. Normal video is often 30 frames per second. With simple animated GIFs like the Venn Diagram, you can go as low as 5 or 10 frames per second. This can significantly reduce file size. There are dozens of tools that will convert a video clip into an animated GIF and each one has its own set of features and capabilities. Often what differentiates the tools is the operating system on which they were designed to work. I provide multiple options below, but I encourage you to experiment. In the last section, we used Camtasia to create a video by recording a screencast of a PowerPoint animation. This process works on other screencasting tools, but Camtasia takes it a step further. Using the Advanced Export Options, you can create an animated GIF right from Camtasia. The 35 second screencast video below shows you how. Below you'll find a number of tools that can be used to convert video clips that are saved on your computer into animated GIFs. I encourage you to experiment. Each app offers its own set of features and limitations. GIFBrewery is the best tool I've tested. It provides a great set of features and an "automatic" mode that produces beautiful GIFs at a great file size. I'll talk more about GIF Brewery below. Free Video GIF Converter (PC) Stand-alone app. In most cases, you'll upload the video and make selections about the GIF it will create. As I discussed previously, these selections often focus on color, duration, frame rate, dimensions, etc. To get the GIF right, you'll likely need to experiment using the settings in the converter tool. 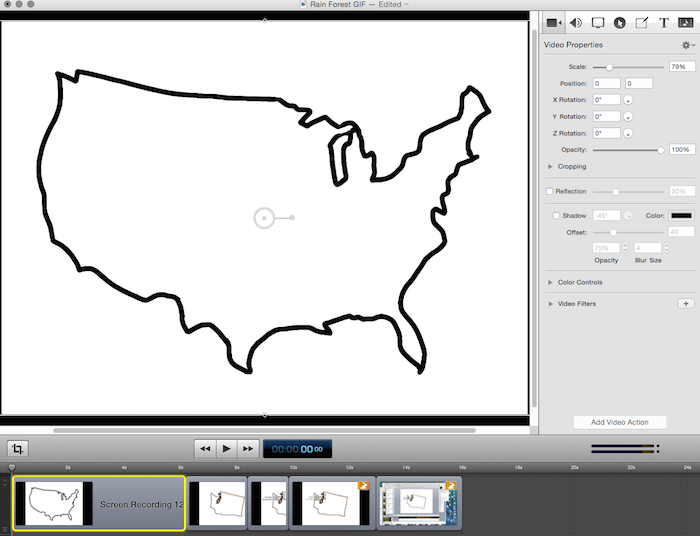 Up to this point, you've created shapes in PowerPoint and animated them. You've also recorded those animations in a screencast and saved the video. Now it's time to convert that video into an animated GIF. Convert the video into a GIF and save it. Notice the file size. Drag the new GIF onto a browser window and watch it play. Does it play as expected? If possible, change the settings in the converter. Use fewer colors or a smaller frame rate. Save the GIF and watch it. Repeat until the GIF works as you'd like. Next we'll take a closer look at optimizing our GIFs to get the most out of them. You've now made your own ExplainerGIFs! YAY! In order to make ExplainerGIFs the best they can be, we'll need to optimize them. This means looking closely at the settings that make them work. Below I will take you through an experiment that uses the settings of GIF Brewery to create the perfect ExplainerGIF. I'm a bit of a weather geek. I love learning about the weather, and living in Seattle, there is plenty of weather to watch. In the world of ExplainerGIFs, that's pretty good. Below I will take you through all the decisions that went into making this GIF work. The animation uses Common Craft Cut-outs, which are usually simple and low color images. I started by laying out all the images on PowerPoint slides and experimenting with animations. I used six total slides. It's helpful to use multiple slides so that the animation settings don't get too complicated. In this example, five out of six slides included the state outline as the base image. For this ExplainerGIF, I used Screenflow. Once I got the animation timing down in PowerPoint, I asked Screenflow to record everything on my screen. Then I displayed the PowerPoint slides full screen. This created a video of the animation. Once the recording was done, it was time to edit the footage to make it as short as possible. Above, you can see that I split the footage into five sections and sped up the last two clips (notice the rabbit icons). Once the footage was playing well in Screenflow, I saved the file. Then I exported the footage to create a file that could be converted into a GIF. Notice the Preset is "Web - Low" and that I've scaled the video down to 30% of it's original size. These are important for reducing the size of the file that will create the ExplainerGIF. Once the video file is exported and saved on my computer, I open GIF Brewery. To start this process, I open the exported video inside GIF Brewery. The video shows up inside the GIF Brewery window. From here, there are a number of controls that enable you to manage the GIF it creates. Keep in mind that many of the options discussed below are also available in other tools. The simplest options are on the main menu. They are Crop and Resize. 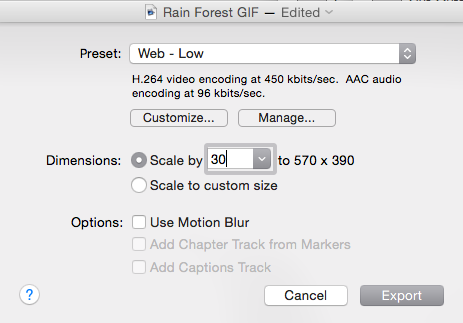 These options can help you reduce the dimensions of the GIF and make it smaller. Next we'll look at fine-tuning options that can make a big difference in file size. These options are available in "GIF Properties". Below is a screenshot of the options I used to create the GIF above. The biggest changes are outlined in Orange. 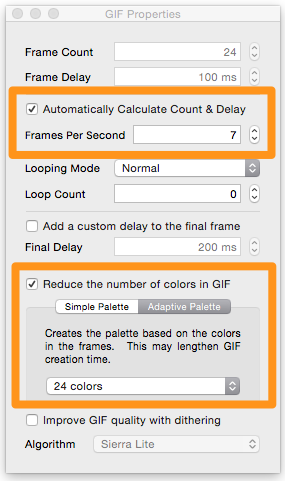 I have found that the best way to use GIF Brewery is through the "Automatically Calculate Count and Delay" option. When this option is selected, you can change the frame rate. For ExplainerGIFs, you can reduce the frame rate (and file size) significantly. The default is 30 frames per second (fps), but I recommend between five and ten fps. If you use too few frames, this GIF will look choppy. Color is another change that impacts file size. As we've discussed, GIFs can handle up to 256 colors. But we don't need that many for ExplainerGIFs. The GIF Brewery default is 48 colors, but I've reduced it to 24 and that made the file smaller. I tried 16 colors, but that change interfered with the color of the rain (blue) and rainforest (green). If your GIF is only a couple of colors, you may be able to use grayscale or black-and-white options. File Size: GIF Brewery will immediately display the file size of the GIF. Your goal is for the GIF to be under 250kbs. This is simply a rule of thumb - the file size really depends on how you plan to use the GIF. Playback: Are the animations stuttering and jerky? If so, there are too few frames per second. Color: Are any colors off? If so, you may need to increase the number of colors available. Once you have everything set, you can simply save the GIF on your computer and it's ready to share. Next we'll finish up with some thoughts on using ExplainerGIFs in the real world. You now have this amazing new power to create ExplainerGIFs. Now what? A trainer or media coach who is interested in adding a new skill to their toolbox. A writer or journalist who needs better ways to communicate ideas. Of course, there is one GLARING exception: Facebook. The social network does not yet allow animated GIFs. Boo. Substitute for Video - Are you currently using video in your work? Are there short videos on your website or lessons? Could they be GIFs instead? Substitute for Images - That diagram you're using, well, it's kind of boring. If you made an ExplainerGIF would it be more compelling? Substitute for Infographic - Infographics are cool. But you know what's really cool? Animated infographics. A fun take on a boring subject. ExplainerGIFs like the one above have become standards in blog posts and in our email newsletters. They offer a fundamentally different experience. At Common Craft we are big soccer fans and in particular, supporters of the Seattle Sounders FC. Over years of going to matches, you get used to the stadium experience. But if you imagine going for the first time, it's kind of confusing. Who are the people singing all the songs? Do I need a rain jacket for my seats? How many people come to a match? We branded the GIF with our logo and twitter handle and encouraged people to share it. We created a page on commoncraft.com to serve as the home of the GIF. Then, we posted the link to Reddit and Twitter. We also uploaded the GIF to imgur. In the first 24 hours, the new page was viewed over 1000 times. An ExplainerGIF gave us a way to create something compelling and worthy of attention. I am convinced that we are in the verge of (or living in) a second golden age of animated GIFs. Today the web is full of cat GIFs and GIFs from TV shows. Here's the thing: we can do better. The animated GIF is a powerful and flexible tool. It can solve problems, it can educate, it can inform in a remarkably effective way. My hope is that you'll use the information in this guide for useful, productive purposes... and that doesn't have to mean boring. Have fun, be creative, make something! If you have any feedback, ideas or concerns, don't hesitate to contact us. We'd love to see you on Twitter or Facebook, too. We've created a set of online, self-paced courses called the Explainer Academy. It's a website devoted to helping professionals develop powerful explanation skills and learn to create do-it-yourself Common Craft Style videos using inexpensive and easy-to-use tools. The Explanation Master Course - A comprehensive look at the theories, skills and strategies that go into powerful explanations. The DIY Media Maker Course - A step-by-step guide to every part of the DIY video creation process from script to video editing. Our goal is to build on the success of our book, The Art of Explanation and provide in-depth resources that teach explanation skills and strategies. The Explainer Academy, like everything at Common Craft, is a project of Lee and Sachi LeFever.